Good vibrations! It means a TON to guys to get positive messages and cheers from fans. Hours, days and weeks of preparation comes down to Derby Day(s) and whether they are leading it wire to wire or flat out couldn’t get on them, words of encouragement are always welcome. Please remember these guys are chasing a dream, working hard, and a lot of the time trying to support their families. There is an immense amount of pressure going on in their life and all it takes is knowing they are affecting just one fan in a positive way. The most amazing thing about our sport is that anglers in general are just good guys and we all share the same passion. Strike a conversation and see where it leads you. Ya never know, you may be fishing on tour one day! 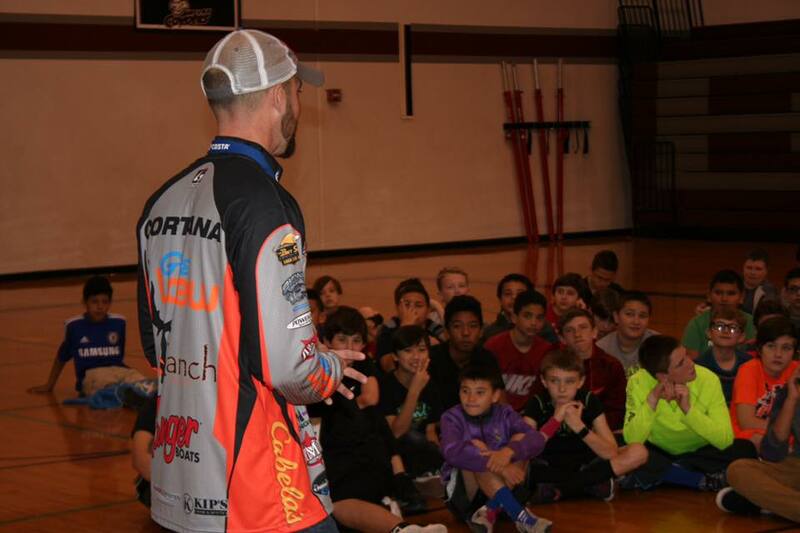 Above: Kyle Cortiana talks with a group of students about a fishing as a professional. Notice and Shameless Plug: These stories come from true life experience, and feedback from our awesome prostaff. (We tagged them for a reason.) Be sure to follow us on facebook and sign up for newsletter. If you are into technology check out our app available on iOS and Android www.spotsafeapp.com and if you are a tournament angler get your tournament trail or event registered FREE on anglerub.com!